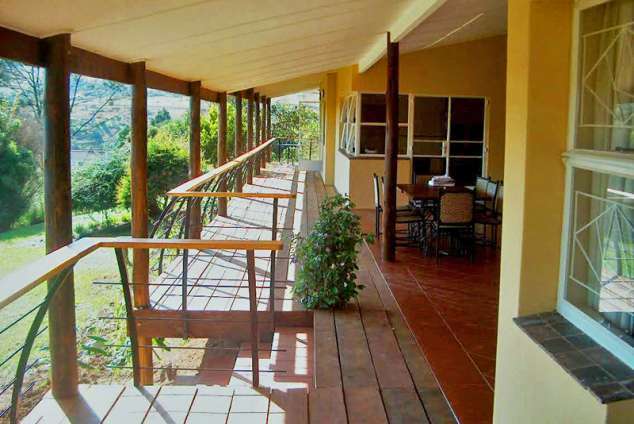 Red Berry B&B - Mbabane Accommodation. Visiting The Kingdom of Swaziland? Join us at the Red Berry Bed and Breakfast. Set within a secure Estate overlooking the magnificent Sibebe Rock and Pine Valley, you will find an ideal place to overnight - Red Berry B&B. A lovely place to stay in Mbabane. We offer a combination of Bed and Breakfast accommodation and are fully serviced. You will meet Lindiwe with her welcoming smile and ability to cook a generous breakfast in the open plan kitchen, overlooking the dining and living room area. Breakfast will be served indoors or out on the covered veranda. We are located close to Mbabane, within 1,2kms of the city center and on a public transport route. Our comfortable rooms are complete with a bathroom-en-suite, a fan, a bar fridge, a heater, luggage rack, double or single beds and DStv. We have four bedrooms with two single beds that can be converted to double beds and two rooms with a double bed and a single bed. Each room opens out onto a timber deck with an amazing view of Sibebe Rock and Pine Valley. We have the use of the solar heated swimming pool on the premises, an enclosed braai area in the garden and the colourful hammocks on the deck. All provided for your enjoyment and to help you relax. Our accommodation is ideally located for the visiting businessman, small groups or overseas visitors. The close proximity to the business centre, restaurants and a short drive to the Miliwane Game Park in Ezulwini or the Malalotja Game Park on the road to Piggs Peak, make the Red Berry an ideal place to stop over conclude a business deal and enjoy all the Kingdom of Swaziland has to offer. We are able to offer facilities for small group meetings, workshops and mini conferences. Groups of 12 to 14 people would certainly be manageable. 35025 page views since 20 May, 2008.